When a file is deleted, it is initially moved into the recycle bin. When the bin is emptied, the file can no longer be found on the system, though all of the contents of the file is still on the hard disk. It is just the filename that is removed. The data will remain on your system until it is overwritten. This makes it possible to restore deleted files using an undelete utility. I searched far and wide for free undelete utilities and found a few of them. There are a vast range of commercial options, but if there are free options available that work, why not use them. I installed each of the programs and then did a scan of my Windows drive with each program. I was surprised to find the results for each to be very different. Each of the programs came up with files that could be undeleted. Glary Undelete, FreeUndelete 2.0 and Undelete Plus each came up showing similar files, with the same bogus names. The list of files that were offered by these programs to be undeleted was not very long, and the filenames were jumbled up numbers making it impossible to know what to undelete. NTFS Undelete showed more files than I had expected. Each filename was the same as it was originally called, making files easy to restore. The interface was nice and easy to use. I had much higher success rate restoring files using NTFS Undelete. It clearly won out in this battle on many fronts. It now sits in my Start Menu awaiting its next life saving use. It is a good idea not to delete files that you may need again in the future, but accidents do happen. 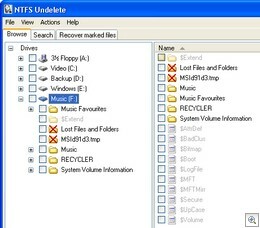 NTFS Undelete is a handy program to have on hand. If you use it on a friends computer or in a workplace, you will be looked up to like a magician. I hope you have found this article useful. Maybe it will help you recover that lost file, and at least save you the time required to search for the right program to use. Is it as good as the ones you checked? I hadn’t heard of Recuva. The program looks nice, but it shows the bogus file names as most of the programs I tested had, making it hard to use. 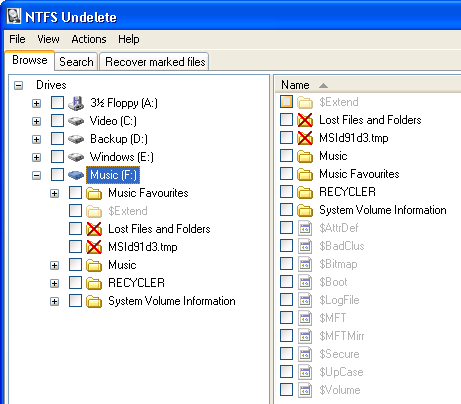 NTFS Undelete seems to be the most user friendly of the bunch. It was pretty flawless in my testing of it. Thanks for throwing it in the mix.